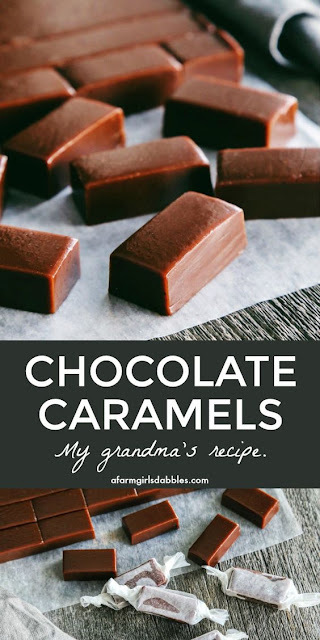 For so many people, including myself, these caramels could be considered my grandma’s food legacy, the single recipe that we’ll always remember her by. Each Christmas day, Grandma Klein would offer two pans of her homemade chocolate caramels. One pan with nuts, one pan without. I always went for the no-nuts, but if that pan was emptied I had no problem moving on to the one with nuts! Generously butter a 9″ x 13″ pan and set aside. 0 Response to "GRANDMA KLEIN’S CHOCOLATE CARAMELS"